Dallas-based Park Cities Pet Sitter Will Host Their 3rd Annual “Stuff the SUV” Event at Pet Supplies Plus on Mockingbird Lane Saturday, October 10th from 11am-4pm. 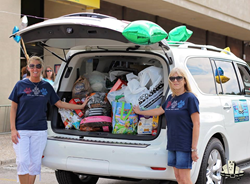 The 2015 “Stuff the SUV” Event Benefits Animal Welfare Organization “Angie’s Friends” and is Part of the NAPPS Presents 4 Pets National Supply Drive. Park Cities Pet Sitter is Partnering with Sewell Infiniti of Dallas to host their third annual “Stuff the SUV” event at the Pet Supplies Plus store at 6060 E. Mockingbird Lane on Saturday, October 10th. From 11am until 4pm that day, Park Cities Pet Sitter staff and volunteers from non-profit animal welfare organization “Angie’s Friends” will be soliciting the donation of pet supplies to aid Angie’s Friends in their mission of caring for abused and neglected dogs in the economically depressed areas of Dallas. This is the third consecutive year that Sewell Infiniti of Dallas will donate the use of a brand new, extra-large Infiniti SUV for the day---so that donors can fill it to the roof with pet supplies. Joette White, President of Park Cities Pet Sitter, is grateful for Sewell Infiniti of Dallas’ participation, and explains why they are so important to the success of the supply drive. Angie’s Friends is named for the grassroots efforts of its founder, Angie Manriquez, who is affectionately known as “The Fairy Dogmother of Dallas.” With the help of her supporters, Ms. Manriquez spends the majority of every day going house to house to feed, water, medicate, provide shelter for, and pat the heads of dogs that have extremely low quality of life, living on short chains in neglectful and abusive situations, never feeling wanted. Angie’s Friends relies exclusively on donations to continue their work. Park Cities Pet Sitter will collect supplies and monetary donations on behalf of Angie’s Friends on Saturday, October 10th, and will continue to do so through November 7th, 2015. To learn more about Angie’s Friends and the “Stuff the SUV” event, visit http://www.pcpsi.com and click on Events. About Park Cities Pet Sitter: PCPSI has served the Dallas area 7 days a week, 365 days a year since 1992. Pet sitting, daily dog walks, pet taxis, overnight sitting, pet supply shopping, litter box cleaning and dog training are all part of the services PCPSI offers. Park Cities Pet Sitter is bonded and insured, and all sitters are employees--not independent contractors. A manager is on-call 24 hours a day to handle any emergencies. Additional information about Park Cities Pet Sitter can be found on their website at http://www.pcpsi.com. About NAPPS: NAPPS is the only national non-profit trade association dedicated to serving the needs of professional pet sitters. The Association aims to help the pet owning public, those interested in pet sitting, and professionals engaged in the in-home pet care industry by fulfilling its vision statement, serving as “the most respected authority in professional pet sitting.” It does so by providing the tools and support to foster the success of its members. Additionally, pet parents can benefit from NAPPS’ free resources including a disaster preparedness guide, tips on how to select a pet sitter, and a nationwide referral service. Visit http://www.petsitters.org for more information.